I wrote a post a few weeks ago about my excitement with local Michigan Shrimp. At the same time Michigan is starting to farm shrimp, the gulf coast region is being bombard with environment destroying oil, not to mention a oil dispersant that was banned in England that is being used by an English company. Don’t you just love a company with ethics and integrity? As the days went by and the “Long Shot” attempts to fix the leak failed, again and again, I waited and hoped that the oil did not reach shore. It has. At the same time that I was waiting to see what happens with the well, I noticed business as usually at the Ann Arbor BP gas stations. They were full of customers getting gas. My question was, Where is the Protest? There has got to be at least one pissed off person in this protest happy town who was frustrated, and angry enough to stand in front of a BP and hold a protest sign. But there was not. I had to wonder what was going through the minds of the people getting gas at a BP. Don’t they watch the news? Are they happy to pay their hard earned recession dollars to the company who basically willfully ignored safeguard to create Americas Trinoble? We are not talking out of sight, out of mind here. This is daily headline news, and it is still going on. Well I say enough is enough. The Federal Government is seriously considering barring BP from any federal contracts on US controlled water or land (Read Article). Better late then never I say. Lets is if they have the guts to do it. And I say we too should bar our contract with BP, or as I like to call them Big Polluter. I made this sign tonight, and I will be stationed in front of various BP’s around town this week. I invite concerned citizens to make their own signs and join me. If you see me this week, please give a supportive wave and honk. 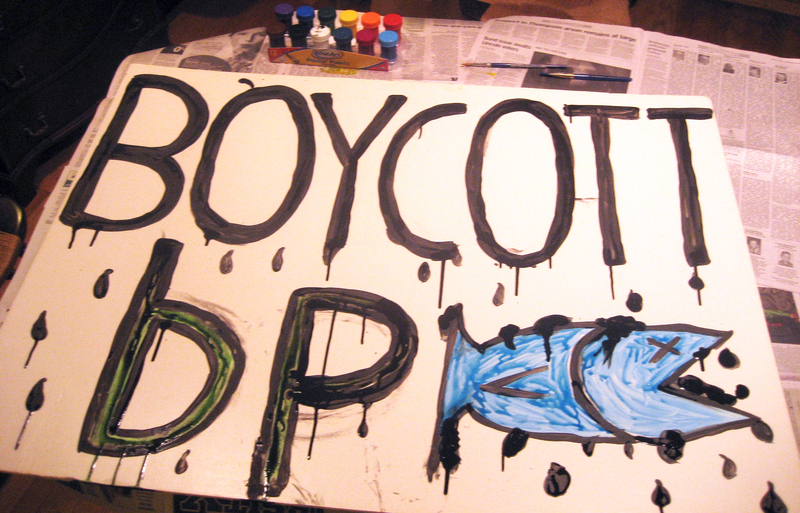 This entry was posted in Food Activism and tagged Boycott BP, Boycott BP Ann Arbor, Boycott BP Gas Station Michigan, Boycott BP Gas Stations. Bookmark the permalink. I would like to join you in your picket of BP stations. Do you have schedule?